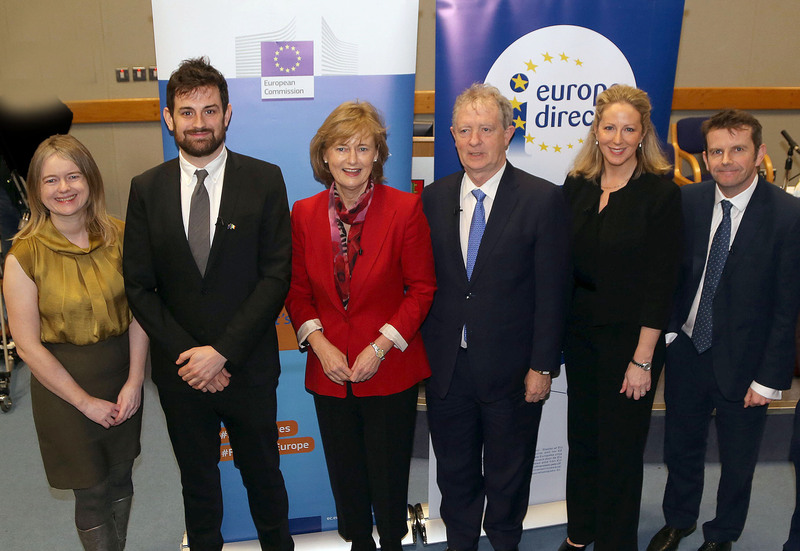 Pictured: Sinead O'Higgins, Waterford Direct Information Centre, Rory Harte, European Movement, Deirdre Clune, MEP, Ireland South, Gerry Kiely, Head of EU Commission Representation in Ireland, Dr Mary C Murphy, Lecturer in Politics, UCC, Gerry Arthurs, Lecturer in International Relations & Politics, WIT. More than 100 people of all ages from Leaving Cert students to senior citizens gathered in Waterford Institute of Technology (WIT) on Friday, 23 November to discuss Ireland and the EU – Moving beyond Brexit at a public meeting organised by Europe Direct Waterford in partnership with WIT, The European Commission Representation in Ireland and the European Movement Ireland. The audience listened to a panel of key players and experts; Gerry Kiely, Head of EU Commission Representation in Ireland, Deirdre Clune, MEP, Dr. Mary C. Murphy, Lecturer in Politics in University College Cork (UCC) and Gerard Arthurs, Lecturer in International Relations and Politics at WIT outline what Brexit will mean for Ireland and Europe. In his opening address Gerry Kiely, Head of the European Commission Representation in Ireland, said "Brexit will have an impact on all countries in Europe, but none more so than Ireland. In addressing these challenges, the European Commission has been very clear. We stand full square behind Ireland, including with regard to the absolute necessity of avoiding the return of a hard border on the island of Ireland." The discussion was ably moderated by Rory Harte of The European Movement who invited the audience to share their ideas, concerns and expectations on the topics at this pivotal time while history is unfolding. The engaged audience put a variety of questions to the panel on a wide range of topics including climate change, tax, CAP, the future shape of the European Parliament, polling day, engaging young voters, pensions for EU Citizens in the UK and the border in Northern Ireland. The Waterford Europe Direct Information Centre, based at Central Library, Lady Lane is a service which helps the public find answers to questions about the European Union. It offers information on all sorts of subjects related to the EU including your rights and opportunities as an EU citizen. It can provide direct responses to general inquiries and, if you have more detailed questions, signpost you to the best sources of information and advice at EU, national, regional and local levels.